I'll bet it doesn't feel any better today. Fans, players and the manager will need more than a few days to recover from the devastating defeat that unfolded in the closing minutes of Saturday's cup tie. Even McGhee's critics, and there are a few, must have had some sympathy for the man as he struggled to deliver his thoughts after the game. His words echoed the thoughts of the Motherwell supporters who had less than an hour earlier been singing the team's praises. Moult's goal put us ahead as the stadium clock showed 75 minutes and yet when the clock showed 90 we were 2-1 down. The feeling as we trooped from the ground was one of déjà vu. Our last visit, in August, followed the same pattern. On that occasion it was McDonald who gave us the lead before Forrester equalised in the second half. 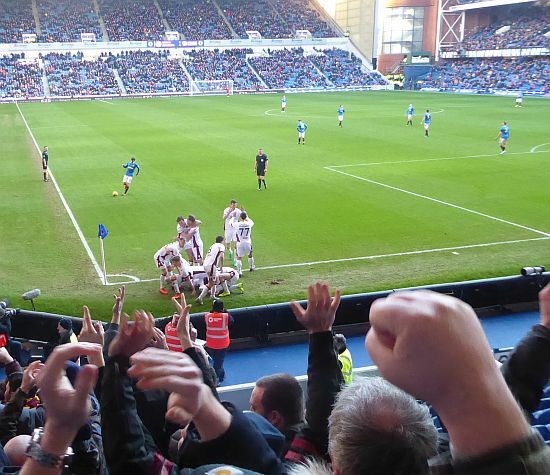 The stadium clock had clicked to 90 minutes before Miller snatched the late goal to send us home without a point. In the game before that one we were one up against St Johnstone but failed to hold on and lost 2-1. More recently there was the crumble when we had Celtic on the rocks with a 2-0 half-time lead. A goal in added time resulted in a 4-3 loss. There will be a chance for the players to make amends next Saturday when the second part of the cup and league double plays out at Fir Park. But if we can't find a way to shut up shop as the final minutes run out then any success seems unlikely. Simple but costly defensive errors have to be eliminated and concentration levels have to remain high until the final whistle. No doubt, when the manager finds his voice, that sentiment will be made clear.